Comic book ads in the 1960's advertised X-Ray glasses for $1.00 - or $2.00 for the De Luxe Model. Shipping was only 25 cents! (Yes - I'm old enough to remember). Of course this was a sham but one has to wonder how many of these were were actually ordered. We still can't make you a pair of X-Ray glasses in our office, BUT the technology in todays eye wear is quite amazing. High definition pictures on television continue to evolve beyond what we ever thought was possible. So too does the high definition vision provided by the lenses we use in our eye glasses. 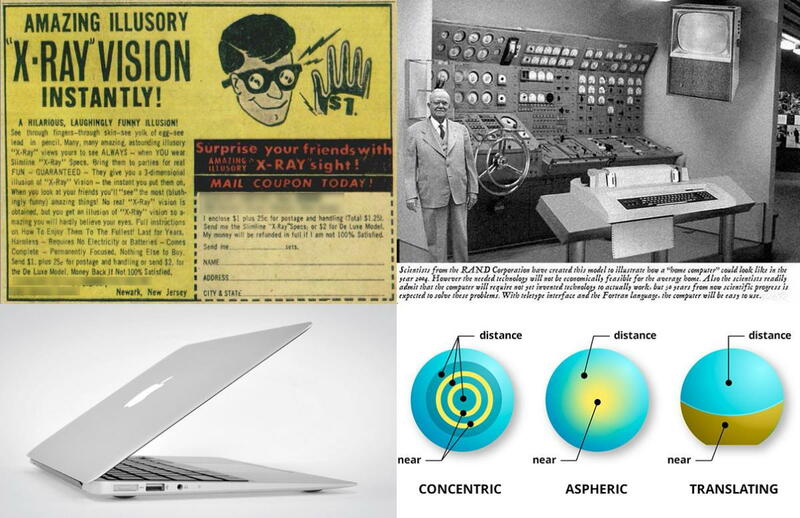 Another analogy comes to mind when thinking about the amazing advances in lens technology available today. It's like the difference between early computers and the MacBook Air I'm typing this on. When the first progressive lenses (no-line bifocals) that came out in the 1970's, most patients could not adapt to the visual distortions and the narrow area of clear vision. Even single vision lenses could not provide edge to edge distortion free vision. Minor improvements were made through the years but the invention of "free form" digital lens surfacing technology was the game breaker. Both progressive and single vision lenses now provide distortion free "Hi Def" vision with large viewing areas. We no longer need to worry about patients adapting to their new prescriptions or making the transition from single vision to progressive lenses.